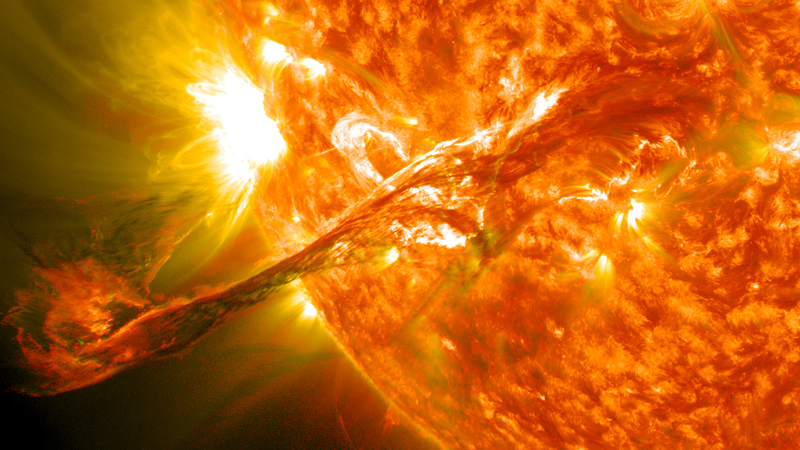 Image, top: On August 31, 2012, a long filament of solar material erupted into space in what is known as a coronal mass ejection, or CME. Seen here from the Solar Dynamics Observatory, the flare did not hit Earth directly but did cause auroras to appear three days later. In the 19th century, out-of-the-ordinary sunspot activity caused a breakdown in communications across Europe and the United States. Named for the amateur astronomer who recorded it, the Carrington Event brought extensive disruption to telegraph systems around the world. Sunspot activity is not rare in itself, but the magnitude of the 1859 solar flare and the fact that it made a direct hit on the earth was unusual. The 21st-century world is far more fragile than we care to think about. Most of us blind ourselves to this reality. But many scientists are now considering such risks and have formed themselves into academic communities to study ways to avoid existential threats of all kinds. The Centre for the Study of Existential Risk (CSER) at Cambridge University is one such body. It was cofounded in 2012 by the United Kingdom’s Astronomer Royal, Martin Rees, in an effort to bring public attention to the problems facing human civilization. The hope is that the public might in turn put pressure on governments to take action. And therein lies the weakness of the approach. In a June 2017 interview with Vision, Rees admitted as much when he said, “It’s hard for politicians to focus on long-term global issues in the pressure of short-term concerns. Politicians are influenced by what’s in the press and what’s in their inbox.” In his 2003 book, Our Final Century (published in the United States as Our Final Hour), he estimated that because of various existential threats, humanity had a 50-50 chance of not making it to 2100. With such odds in view, I asked if he was optimistic. “I’m a technical optimist but a political pessimist,” he replied, revealing that while he feels his confidence in technological salvation is justified, his faith in politicians’ willingness to bring about long-term results through appropriate policy is practically nil. In the mind of Rees’s colleague Stephen Hawking, the only hope for survival seems to be other-worldly. The renowned cosmologist believes that we have less than a hundred years left on Earth and has proposed that nations unite to return man to the moon by 2020, journey to Mars by 2025, and establish a lunar base over the next 30 years. But is this sci-fi approach to human existential threats not merely another way of avoiding the essential problem—our human nature? If we cannot cooperate here on Earth to resolve the 10 recognized challenges that will bring civilization to the point of extinction, why would exporting human nature to other worlds provide a better outcome? Is this not another blind spot? Ah, but human nature can be overcome by technological intervention, some will say; we could reprogram ourselves, cyborg-style, and evolve a new form of humanity on other planets. Surely the answer lies not in the hubris of space exploration and technological prowess but in the humility to live peacefully with each other and with this planet. How shall we do that, if not through a renewal of the kind that a prescient warrior identified at the close of World War II? Warning of the dangers then threatening the survival of civilization, Douglas MacArthur said, “The problem basically is theological and involves a spiritual recrudescence and improvement of human character that will synchronize with our almost matchless advances in science, art, literature and all material and cultural developments of the past two thousand years. It must be of the spirit if we are to save the flesh.” This appeal had no narrow denominational basis but was reminiscent of the prophetic promise that the day would come when the human heart would begin the process of spiritual transformation: “This is the covenant that I will make with them after those days, says the Lord: I will put My laws into their hearts, and in their minds I will write them” (Hebrews 10:16). Are we yet too blinded to recognize the existential danger and to humble ourselves and seek God’s favor? For only by this will we escape delusion and disaster. National Academy of Sciences, “Severe Space Weather Events—Understanding Societal and Economic Impacts: A Workshop Report” (2008). Neil Postman, “Informing Ourselves to Death” (1990) in The Nature of Technology: Implications for Learning and Teaching, edited by Michael P. Clough, Joanne K. Olson and Dale S. Niederhauser (2013).